he name Colleton derives from the Irish Gaelic name "Mac Codlatain", meaning "son of the sleeper", with the clan originally based in counties Wexford, Kilkenny and Carlow in Ireland . Variants of the name include Mac Culleten, Culleton, O' Colleton and Colleton, whilst the townland of Ballyculliton in north Tipperary is said to be named from a family of Collitons based there. Martin Colleton was Calum's and Jamie's great great great grandfather. Martin was a baker in Carrick-on-Suir who had at least two sons, possibly three. Martin married Jacobus Phelan on July 22nd 1843 in a Roman Catholic ceremony in Carrick. The witnesses to the wedding were John Hanigan and Bridget Murphy. In the register Martin's name was recorded as Culiton. In Griffith 's Valuation 1851 - 1853, Martin is recorded under the name of Cullitan at Greystone Street in Carrick. He was renting the property from Thomas Fitzpatrick, with the building hired at an annual rent of £1. Martin tragically died in the workhouse in Carrick on November 3rd 1876 , aged 76. The cause of death was diarrhea, and the informant was Thomas Dunne at the workhouse. Martin's occupation was again noted as baker. Michael was born in County Tipperary in approximately 1848. On July 21st 1875 , aged 27, he married 25 year old confectioner Bridget Lonergan, daughter of boatman James Lonergan. The witnesses were Walter Dalton and Anne Donnelly. In the record both Michael and his father Martin were noted as bakers (GROI M 1875 Vol. 14 p.250). That this meeting endorse the programme of the United Irish League as laid down by the great National Convention recently held in Dublin. That we pledge ourselves to take steps immediately to organise a collection for the General Election Fund in this town and district, as we believe, to make he General Election Fund a success is the most pressing duty of Irish Nationalists at the present moment. In the 1901 census in Carrick, Michael is recorded as living at 2 O'Donnell's Lane, alongside his wife Bridget, and his two sons Patrick and John. The family are also found there in the 1911 census, although Patrick had moved away at this point. In this census Michael was noted as a 62 year old Roman Catholic baker, resident at 2 O' Donnell's Land, his wife was 65, and his son John as a 28 year old billiard worker. He had been married for 36 years, meaning the marriage in approximately 1874 or 1875. Michael died in Carrick-on-Suir at some stage between October and December 1915, with his age listed as 68 (GROI D 1915 Q4 Vol. 4 p.373 Carrick-On-Suir). His wife Bridget died just over a year later between January and March 1917, aged apparently at 66 (GROI D 1917 Q1 Vol. 4 p.405). Patrick was dead before the 1911 census was recorded. John was born in about 1883. In the 1911 census he was noted as a billiard worker, aged 28 and single, Roman Catholic and able to read and write. Martin was Calum's and Jamie's great great grandfather - see below. Thomas Colleton is likely another son of Martin, though this has still to be confirmed. He married in 1864 in Carrick-on-Suir to a woman called Margaret Daniel. The couple had a girl called Bridget Colleton born on January 26th 1871 in Carrick-on-Suir. Elizabeth married a baker called Walter Dalton in Carrick-on-Suir on February 7th 1880 . Although parents for both of the couple are not listed in the certificate, Walter was a witness at Elizabeth 's brother Michael's wedding in 1875, and so it is almost certain that Elizabeth was Michael's daughter. In 1901, Elizabeth was resident at 22 Bridge Street in Carrick-on-Suir, with husband Walter, and children John, Maryanne, Johanna, Walter, Michael, Ellen, Elizabeth and Alice. Also present were John, Michael and Johanna COLLITAN (noted as a baker). In 1911, further information is provided. Elizabeth was noted as 50, wife to Walter Dalton, a 66 year old working baker. The couple had been married for 30 years and had had eight children, all of whom were still living. As well as children Minnie, Walter, Ellie, Elizabeth and Alice, also present in the house was 40 year old Michael Colleton, noted as a boarder, but in fact Elizabeth 's nephew, who was also noted as a working baker. Whilst everybody in the house was noted as being able to read and write, and to understand both English and Irish, the registrar has subsequently written, rather curiously, the words "Treat as English only, therefore not registered". Possibly the Daltons or the registrar were playing politics here? John was born on December 8th 1880 at Cook Lane, Carrick-on-Suir. His father was noted as a baker. In 1901 John was present with the family at Brideg Street in Carrick, but not in 1911. Noted as Maryanne in the 1901 census, but as minnie in 1911, in which she is also noted as a 28 year old dressmaker, and single. Johanna was born on May 25th 1884 at Mill Street, Carrick-on-Suir. Her father was noted as a baker. In 1901 Johanna was at Bridge Street with her parents, but was not present with the family in 1911. Walter was born on May 1st 1886 at Mill Street. His father was noted as a baker. In 1901 Walter was with his parents at Bridge Street for the census. In 1911 he was still with his family, and was a single baker. Michael was born on August 12th 1888 in Carrick-on-Suir. His father was noted as a baker. In 1901 Michael was with his parents at Bridge Street for the census, but was not wioth them in 1911. Ellen was born on September 25th 1890 at Mill Street, Carrick-on-Suir. Her father was noted as a baker.In 1901 Ellen was with his parents at Bridge Street for the census. In 1911 she was still with her family, noted as a single dressmaker. Alice was born in 1898 at Carrick-on-Suir. In 1901 she was with her parents at Bridge Street for the census, and in 1911 she was a thirteen year old girl with no occupation. Martin Colleton was Calum's and Jamie's two times great grandfather. In his daughter Ann's wedding certificate, it is learned that Martin was a baker by trade. In fact, Martin's wife Kate was famous in the town for producing a type of bread roll known as "Colle's Bappes". In the 1901 census, martin is listed with his wife and children Martin, Annie, Maggie, Marianne, John and Patrick, as living at 30 Greystone Street, Carrick. When his son, also called Martin, joined the Second battalion of the Connaught Rangers on October 22nd 1902, the family address was again noted in his service records, along with the names of Martin's and Kate's other children, Patrick, John, Anna, Margaret and Maryanne. In 1911 Martin and the family are then further recorded as being at number 20 Greystone Street (with Maryanne simply noted as Mary in this census). In 1914, Martin's eldest son, also called Martin, having been a member of the 2nd Battalion of the Connaught Rangers for a decade, travelled to France and then Belgium to fight the Germans, but within weeks, on November 2nd 1914, he was tragically killed in action at the first battle of Ypres, and event that must have been deeply distressing for the Colleton household back home in Tipperary. Martin and Kate were notified of their son's death on December 8th 1914, and two days later, the regiment received a letter from Martin senior, requesting further details on his son's death. The letter survives amongst Martin junior's service records at the UK's National Archives at Kew, though is very difficult to read, being part of the 'burnt records' series WO363, which was badly damaged by fire during a Luftwaffe Blitz attack in London during the Second World War. Although the letter is barely legible, parts can still be made out. 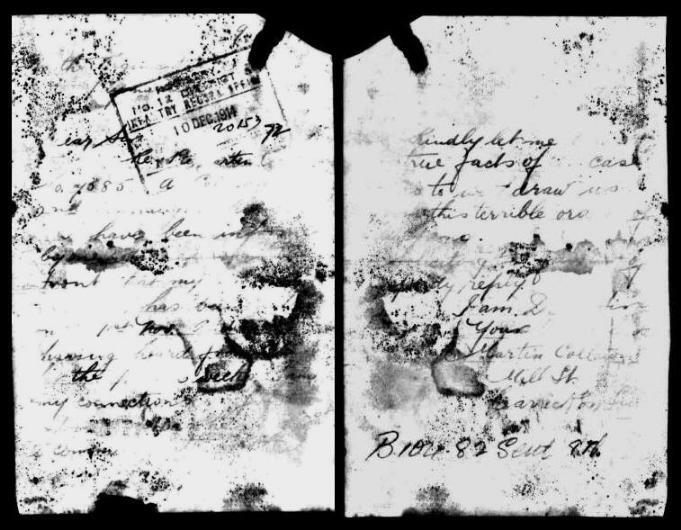 Martin starts by saying that that he has received a letter about the death of his son, Private Martin Colleton, service number 7585, and requests of the officer to whom it is addressed to "kindly let me have the true facts of the case to help us to withdraw from this terrible ordeal." His signature confirms that by this stage the family are now residing at Mill Street, Carrick-on-Suir.